For a Limited Time recieve the Pinnacle Natural Brilliance How-To DVD FREE with your purchase of this kit! Retail value $12.99. Everything you need to remove swirls with your dual action polisher! Unsightly swirl marks and scratches can ruin your paint finish! These blemishes are often caused by improper washing and drying techniques, but some are caused by the manufacturing process. 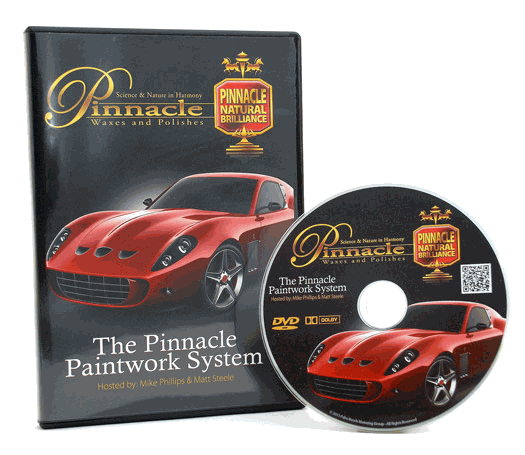 You can correct these problems and perfect your paint with the Pinnacle Complete Swirl Remover Kit. Pinnacle Advanced Finishing Polish gives your vehicle�s paint maximum impact with a clear, reflective gloss and flawless appearance. This is more than a finishing polish; it�s the final word on shiny, smooth paint. With micro fine diminishing abrasives, Pinnacle Advanced Finishing Polish burnishes paint to a crystal clear gloss that looks and feels mirror-smooth. This is our most user-friendly, clearest-finishing final polish ever! Pinnacle Advanced Swirl Remover brings �user-friendly� to a whole new level! Diminishing abrasives and water-based lubricants blend away imperfections gradually, leaving a smooth paint surface. This tempered approach to polishing eliminates imperfections while being extremely gentle on the paint. Pinnacle�s diminishing abrasives are tempered to break down slowly and evenly under the motion of the oscillating pad. A dual action polisher provides just the right motion and friction to maximize the performance and working time of these abrasives. This approach softens the abrasives� impact on the paint, which ultimately preserves more of the paint. If you have a newer vehicle or meticulously maintained paint, Pinnacle Advanced Swirl Remover is for you. 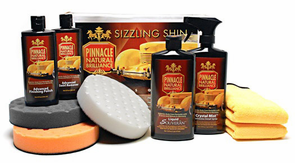 Pinnacle Liquid Souver�n Wax is the only liquid carnauba wax to come close to the sizzling shine of Pinnacle Souver�n Carnauba Paste Wax. With an amazing blend of carnauba and liquid crystalline polymers, Pinnacle Liquid Souver�n Wax achieves the deep, wet gloss of a paste wax in a long-lasting, easy-to-apply, liquid formula. The polymers are added to enhance the brilliant shine, the protection, and the durability of Liquid Souver�n. Crystal Mist Spray Wax is a blend of super-refined, Brazilian Ivory Carnauba, conditioning oils, and crystalline polymers. Use after washing or anytime to bring back that just-waxed shimmer. Detailer's Tip: Mist the foam pad with Crystal Mist Detail Spray prior to applying a polish or wax. The damp pad will spread the product more easily than a dry pad. The Orange Light Cutting Pad is designed to help you remove paint imperfections with your dual action polisher. This pad is the workhorse of all the foam pads because it works with a variety of products on a variety of problems. Use the orange pad with the ASR to tackle moderate to heavy swirls, scratches, and oxidation. It has enough cutting power to remove blemishes, but it will not do further damage to your paint. You may also use the regular Swirl Remover with this pad for light imperfections that did not respond to the white polishing pad. The 6.5� White Polishing Pad is a flat pad intended for fine polishes and pre-wax cleaners. It has very little cutting power so it will not abrade your vehicle�s paint. Use this pad with Pinnacle Advanced Finishing Polish to remove light blemishes and restore gloss. Flat pad has soft composition for applying glaze, finishing polish, sealants, and liquid waxes. Polishing tip: When polishing your vehicle, always work in 2� square sections. Set your dual action polisher between 4 and 4.5 RPMs. Work in overlapping figure eight patterns until the polish starts to dry. Buff away haze and check your results. Repeat if necessary. Clean pad with a Duo-Spur Foam Pad Cleaning Tool periodically to keep the foam from becoming caked with polish. Always apply a wax or sealant after polishing. When tiny lines show up in your vehicle�s paint, you can do something about it. The Pinnacle Complete Swirl Remover Kit equips you with the best polishes and pads to tackle a wide range of surface problems. Your paint will look and feel like new! A total retail value of $192.91. Save $42.92! My swirl product came in with a crack in the bottom and leaked over the balance of my product. If it could be replaced or a replacement container would be appreciated. ProsI'm happy with all the Pinnacle Products. Just good results on my finishes.